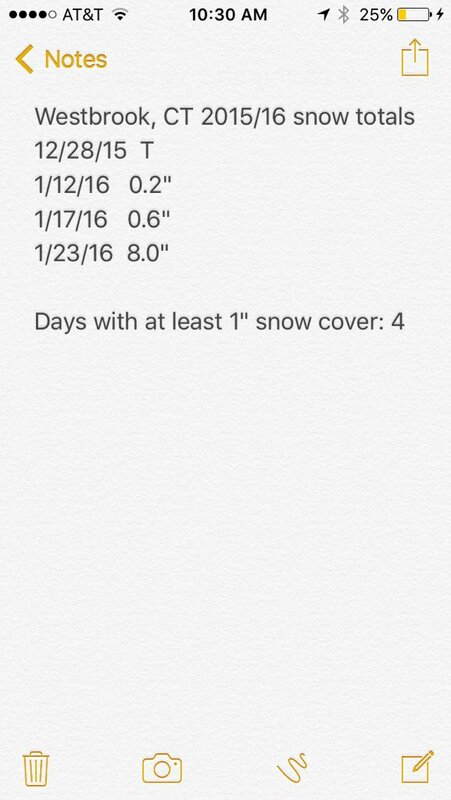 I’ve been keeping track of the snowfall numbers in earnest this winter for my town. This is the first year I’ve really done that. With the warmer weather so far this week, a decent amount of melting has taken place. Since I dropped below 1″ in snow cover today, here are the updated snowfall numbers for the season. I’ve added a permanent spot on the blog so anyone can access these numbers on demand. Upper levels: Today we’re under the influence of some weak ridging centered off to our east in the Atlantic. A shortwave trough passes through the region tonight, some brief ridging rebuilds for Thursday, then a larger more amplified trough approaches us on friday as a piece of northern stream energy swings down from Canada and phases with southern branch energy. Surface: A weak cold front comes through tonight. Another frontal system approaches as a clipper moves into northern New England on Thursday. An intensifying low develops well offshore Friday with little impact if any to the area. As you can see courtesy of Dr. Ryan Maue’s weatherbell maps the 12z NAM, just as an example – the best vertical velocities stay offshore with the Friday coastal low. Cape Cod perhaps could see some light precipitation from this but it’s overall not an impressive setup. After that: An inland storm track into early next week should keep us mild to start February.